The Princess of Disks is learning about her power to manifest. She is in awe of her connection to the earth and her ability to anchor life on the material plane. 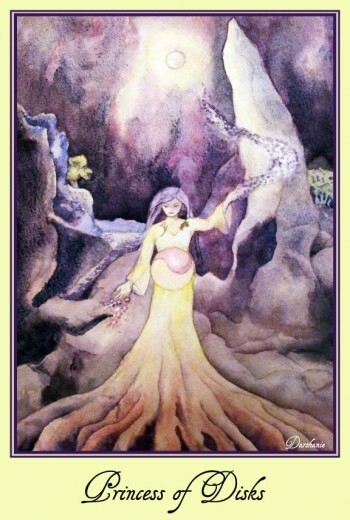 The earth element is the densest element in the Tarot. It deals with the practical matters of survival on the physical plane. This is related to the basic needs of food, shelter, health and wealth. Our bodies come from the earth and return to the earth. From the earth we grow our food, find materials to create secure homes, and take resources from which we trade and create commerce. Survival can be a struggle or it can be a creative process. When the abundance and creativity of nature is not understood, then survival becomes ruled by fear. This locks the consciousness onto an instinctual level that blocks the creative intuitive mind. The Princess of Disks is learning how to let go of this fear so that she can master the earth element. The Princess is learning about the energies of the earth and learning to let go of the fears surrounding survival. She sends her roots deep into the ground and in cooperation with Mother Nature, is trying to manifest her life. Being able to create and bring forth life is a magical act. Here we have her in the dead of night under a shining moon. She is standing next to a spring that bubbles from deep underground. There on the ancient rocks she releases her fears into the earth. Her roots form her support and stability. 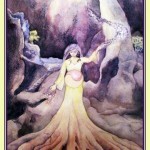 She is feeling the forces of life flowing down from the moon and ripening in her belly. The creation of life is the expression of the female energy. She is learning to draw Spirit into matter. There is enormous energy present in this card. Humanity is just approaching the lessons of the Princess of Disks which are about letting go of fear, healing our connection with nature, honoring the expression the Divine Feminine, knowing that through the feminine matrix we have the ability to manifest, accepting that there is no such thing as defeat and no need for fear because we are spirit in form and we can be creators of our fortune. The Princess of Disks signifies someone who wants to learn how to support herself. It could indicate pregnancy, budding opportunities for making money, and the need to take more responsibility for your health. When you get this card, try to foster your relationship with nature so that you can feel her support in your life. Eat more natural and live giving foods, hug a tree, lay on a rock, spend time in nature and relax until you can feel her slow pulse. Communicate to her your fears and ask her to absorb them for you. With love and respect, ask her to fill your body with strength so that you can become a strong vessel to manifest an amazing life. This entry was posted in Disks, Tarot on January 25, 2014 by darshanie.